The four Harrison County English Language Specialists gave their students the opportunity to tell their stories. Literally. Nearly 40 students published their very own books as part of a program offered through Harrison County Schools. Lesley Morgan, Cari Lavake, Jessica Moats and Rosemarie Morton worked with students from Kindergarten through middle school to improve language skills and collaborative learning. 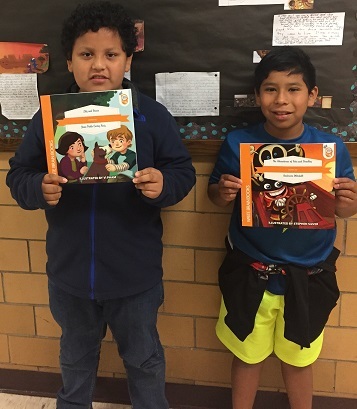 They used Write Brain Books for the curriculum, which featured textless, illustrated books where each student had the opportunity to create their own unique story. On June 6, the young authors gathered at the Best Western Hotel in Bridgeport to give a public reading of their finished works. Family and friends gathered for a Culture Night, where they learned about global traditions and how they were reflected in the stories. Each student named their book, dedicated it, completed a page about the author and created their own story based on the illustrations.